Fire Cider is an herbal remedy made most famous by Rosemary Gladstar, but my understanding is that the remedy has been around for a very long time. There are bunches of different recipes and ways to make it though almost all seem to have apple cider vinegar, horseradish, ginger, onion, and garlic. There are variations that include hot peppers, citrus zest, turmeric, rosemary, ginseng, and other herbs. I imagine it's like most herbal remedies in that we use what's local and easily available to us to create something potent and easily duplicated. I started making fire cider last winter, even though I'd known about it for years. It's now become a regular part of our daily health habits and one I do believe that helps us with some particular health issues. The ingredients are chock-full of anti-microbial and anti-inflammatory properties as well as being a decongestant and mover of circulation. It's a simple tonic, full of easy to find ingredients that when taken daily help flush inflammation from the body as well as just generally move the blood around and keep us warm. It also helps with digestion because it stimulates gastric juices, which can really help with bloating and other issues. All of it's decongestant and antibacterial properties make it great remedy to have on hand for cold & flu season. Learn how to make fire cider - an inflammation flushing, digestive aid, and antibacterial tonic for the home medicine chest. In a half gallon glass jar, add the ginger, horseradish, onion, garlic, and orange zest. Pour the apple cider vinegar over all. Put a lid on it and give it a good shake. Place in a dark cupboard for a month, giving a shake now and then when you remember. At the end of the month, strain out the solid ingredients. Add the honey to the liquid fire cider and store in an airtight glass bottle. Change it up by adding fresh herbs, cayenne pepper, red pepper flakes, chopped jalapenos, etc. as desired. Take a tablespoon every day to help with inflammation and digestion. If a cold is coming on, take an extra dose or two throughout the day until the immune system feels back to normal. 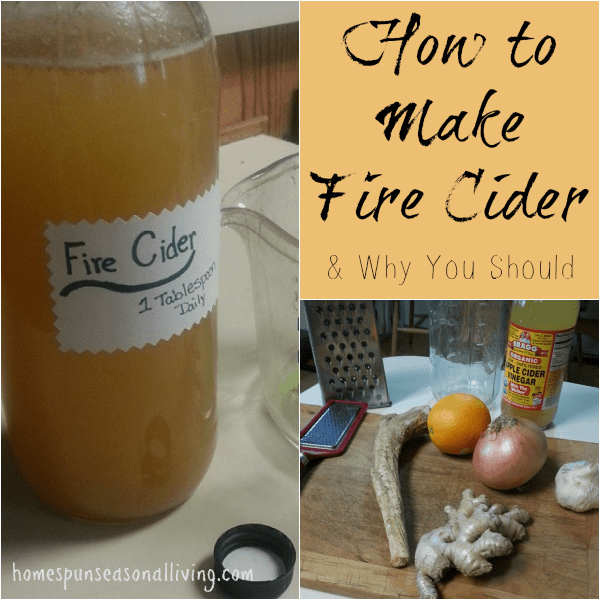 Is fire cider part of your herbal health routine? What variations do you make to your recipe? I was wondering if you would suggest this to people who suffer from migraines when eating onions. Is there an alternative to the use of onion? I don’t know for sure, I’ve never seen a recipe without onion. That being said, if I was in your position, I’d probably skip the onion but increase the other bits – garlic, horseradish, ginger and probably add some hot peppers. I’d at least give it a whirl that way and see if it was beneficial to me. Fire Cider vs Elderberry Syrup. Are these roughly equivalent to each other in terms of general health tonic and cold/flu resistance? I made fire cider last year and my other half really did not like taking it. I tossed into a half glass of OJ or took it straight and had no problem (not saying I liked the taste *G*). So this year I made elderberry syrup and he is taking it with no complaint but I’m wondering if it will do the job as well. Any thoughts on the subject? I personally don’t use elderberry as a general health tonic. I only use elderberry when I feel a cold coming on and I’ve never read where it should be used to help flush inflammation or help with digestion. For me the fire cider is more about inflammation and blood warming than cold fighting though it does help with that too. So for colds, elderberry is always going to be my first go-to, for everyday keeping inflammation down that’s fire cider in my house. Does that help? What would you think the shelf life of this would be? How would you prepare it to last the longest? It’s infused vinegar, once you strain the stuff out, there’s nothing to really rot or go bad. That being said, I can’t say for sure how long the shelf life is… I normally make a double batch which lasts us about 60 days (after straining) and I just keep it at room temperature and it’s just fine. I wouldn’t can it, but refrigeration could make it last a while I believe. 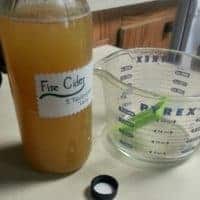 Regarding the shelf life of Fire Cider, I made a batch last year and it sat on the counter all winter, maybe six months or more, with no issues. I had to shake it every morning because I used powdered turmeric and it always settled out. How much turmeric did you use? I used 2 T of turmeric powder. This year I am going with the actual root to avoid that fall out. Well yay! You are most welcome. I was wondering with garlic in it, will you smell of garlic taking it every day? Thank you! I couldn’t find horseradish root, can horseradish in jar be substituted? If so how much should I use? Thank you.. The stuff in the jar usually has a bunch of additives vinegar, salt, etc. If you can find something that is 100% horseradish in a jar, go for it. What is in it this that helps with circulation? Ginger is a traditional herb used to get the blood moving. It will soon be time to decant and strain my batch of fire cider. What do you do with the left behind fixin’s? I often read suggestions of using it in stir fry but I have never done it. I couldn’t eat that mixture honestly, too hot for me. I toss it, not even compost because of the vinegar. Plus most of the flavor is going to be left in the infusion. We take about a Tablespoon each day. If sick, 3 Tablespoons spread out over the day until illness passes. So I would probably be able to replace this with my tablespoon of ACV daily. Or would you do both? Just checking. I personally would just do the fire cider but I feel compelled to say I’m not a doctor or trained healthcare professional. I imagine you could use maple syrup, but I haven’t tried it personally. I would certainly give it a go. Thank you, so much! I’ll try that! I accidentally added the honey in with everything else at the beginning. Will that cause it to go bad? I don’t see how it would go bad – you can easily infuse honey and honey doesn’t spoil. It might change the taste a bit – maybe not get as hot but I wouldn’t worry about it at all. Awesome – thank you! Another person commented on another site that she thought it might turn it into alcohol. I guess I will find out! Thanks for replying. How did your fire cider turn out Janet? I just did the same thing and I’m hoping mine turns out okay! Will Fire Cider Help With Fighting Cancer And Or Stomach Fat. Just Asking; Because I Need To Rebuild My Immune System. I Believe That’s The Reason Why People Get Cancer Or Some Type Of Illness Because Their Immune System Is Weak. I don’t know the answer to this question. I’m not a doctor or a trained herbalist. Fire Cider has been used to boost the immune system during colds but I’ve never read about it being used to fight cancer, stomach fat, or rebuild immune systems. Please seek professional / trained medical advice. Can it be given to chidren? Mine are 7 and 11. As far as I know yes, I know plenty of folks who do. I’d give a smaller dose though and see if they’d even drink it. Kids definately will prefer the taste of elderberry with honey. Of course fire cider can be made with lots of honey too. Until I got used to it I would pour it into a small glass of orange juice. Still not a sipping drink but much easier to swallow. Just out of curiosity. …what happens if you mix it all up and forget about it for like….a year? Is it still any good? Or does my friend * need to throw it out? I’ve let it go a little long but not a year – although it would essentially just be a giant pickle… That’s a toughie. I’d probably toss it. You’ll notice, I don’t use hot peppers in my recipe. It’s too hot for me personally so I skip the addition of peppers. Try adding some more honey to cut the heat, perhaps. Would Fire Cider help with muscle pain and body aches in general? This would not be my first choice for treating general aches. Do you know what’s causing the pain and aches? I would treat the cause if at all possible. Fire cider is good for flushing inflammation but general aches make me think that something else is involved perhaps (and I’m not a doctor just taking a guess). Could you recommend a good source of horse radish root? I can not find it locally. I’m sorry I don’t know of any fresh sources. I imagine many companies online sell dried root but I haven’t tried that in fire cider.